Nestled on a hilltop amongst the lush coconut groves of Chaweng Noi, this exquisite 6-bedroom vacation home offers the perfect combination of privacy, space and splendour, the perfect choice for a Koh Samui vacation. Located more than 80 metres above sea level, this large Samui villa boasts stunning views over the lush landscape and ocean beyond. Guests can enjoy the panoramas from every living area, and from most of the bedrooms, all optimised with sliding glass doors for an indoor/outdoor effect. From the outset this contemporary home offers bright and airy living space, with smooth tiled floors, state-of-the-art amenities, mood lighting and stylish décor throughout. On arrival, guests enter on the ground floor and step into an expansive indoor/outdoor living space. To one side lies a modernist kitchen with state-of-the-art amenities, hidden units, a large cooking island/breakfast bar and high-end fixtures. The entire living area opens out onto an expansive sun terrace, with views so beautiful you’ll think you’ve arrived in paradise. This stunning space is equipped with a large infinity-edge pool that spills gently into the blue beyond, creating a breath-taking blend of sea and sky. Guests can laze the hot Samui days away swimming laps in the pool, relaxing in the Jacuzzi, or sunbathing on luxury loungers that look out over the sparkling Gulf of Thailand beyond. Dining alfresco is easy with a covered lounge sala, perfect for taking a break from the heat or relaxing with a cocktail to watch the spectacular Samui vistas. Guests can serve drinks from the outdoor bar area, equipped with bar stools for extra comfort and convenience. Stairs lead from the living space to the upper level of the home. Here you will find three spacious en-suite bedrooms. A stunning master bedroom offers a king-size bed, lounge area and en-suite bathroom with rain shower and freestanding bath. The second bedroom has two twin beds with guest bathroom and the third bedroom is equipped with king-size bed and en-suite. All bedrooms are designed with style in mind, complete with tasteful furnishings, walk-in wardrobes, stylish artworks, luxury linens and private patios. The lower ground floor offers three further bedrooms, all en-suite. Two bedrooms with king-sized beds and gorgeous views and a third with a full size double bed and a bunk bed in a separate area (no sea view). Also on this level is a large open plan games room, complete with pool table and mini fridge. Every room on each floor opens out onto a joint balcony offering magnificent sea views. This exquisite villa in Koh Samui is perfectly located in a private, gated community, offering perfect peace and privacy. If you can bear to leave the comfort of home, then there are endless things to see and do during your trip. Chaweng Noi is often dubbed the Beverly Hills of Samui, oozing elegance from every aspect and with plenty of attractions to enjoy. This home is conveniently located within a 15 minute drive from KohSamuiAirport, and under 10 minute to the nearest supermarkets including Tesco, Big C and Makro stores. The nearest beach is just a short drive away, boasting powder-white sands, crystalline waters and a variety of water sports to sample. 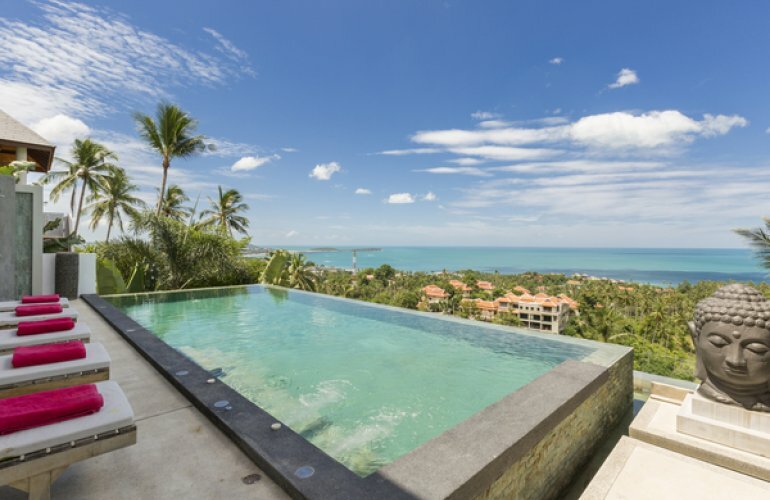 This gorgeous villa in Koh Samui is the perfect choice for a Samui vacation, offering a peaceful and quiet escape from the hustle and bustle of the island.